During my time at the language course last year in Germany, I met a lovely group of Canadians, specifically from Newfoundland and Labrador. After a few FaceTime calls and ample group chat messages, two of the girls had arranged to come over this way to see my neck of the woods. I met them in Dublin for 5 days, where we experienced the wonders of the Irish capital; Jameson’s whisky and the Viking Splash Tour being the highlights. I managed to meet up with one of my Irish friends from Germany, who actually lives and studies in Dublin. We also took a trip to Northern Ireland, which was well worth doing. We went to Belfast and I had my eyes opened to all of the unrest there- I had no idea it was still happening now. The city has a huge wall down the middle to keep it divided and residents don’t feel safe taking it down even now. The Black Taxi Tour took us around the city and our tour guide explained in detail the history and present day issues. I would strongly recommend this tour to anyone, it really is worth doing. 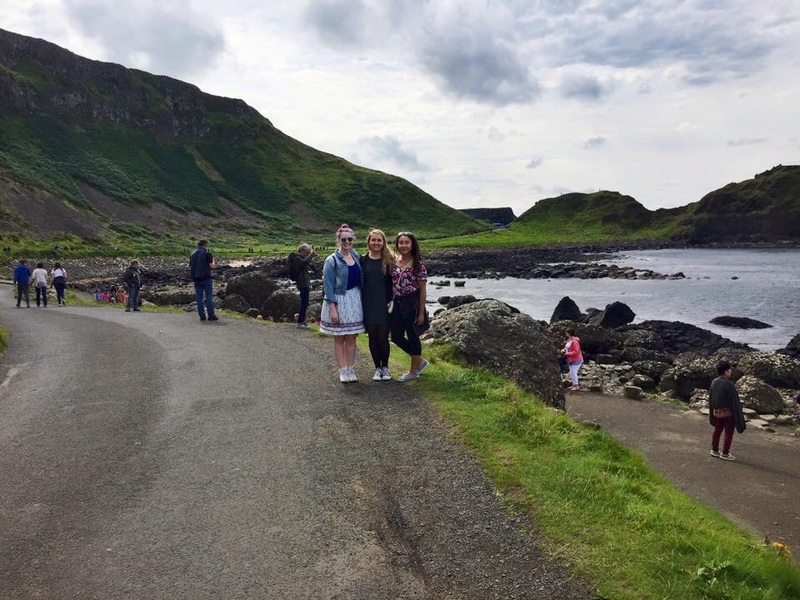 We also went to The Giant’s Causeway and the Carrick-a-Rede rope bridge (one ticked off the bucket list there- climbing over a rickety bridge in strong winds suspended 100ft over sea level). Northern Ireland has some absolutely stunning views and I personally much preferred it to Dublin. The girls then came back to my house in Nottingham to see some of England. Of course we went to London for a few days (where it rained constantly for a true representation of England). I’m not really a fan of London and so don’t go very often myself; I find it too crowded and busy. One of the reasons I love living in Leicester is that I can walk around the city without having people barging into me. We did some of the touristy things, such as visiting dear Elizabeth and some of the museums. We also went to see Phantom of the Opera which was incredible! I am a right musical boff, as are the girls, so it was a mutual decision to see a show whilst in London. Well worth the money! Once back from London we took a trip to Liverpool and to conclude their visit I showed them the sights of Nottingham. I found it difficult to be a tour guide in my home town, it’s not something I’ve done before and I shamefully realised that I haven’t actually been to see half of the things that Nottingham is famous for. I’d never seen the Robin Hood statue, never visited the castle (a fact disputed by my mum who swears she’s taken me as a child) and never had a drink in the oldest pub in England. I am now certainly more educated and if I ever get visitors again I will be much more prepared! It was lovely to see the girls after a year apart and hopefully I’ll be hopping over the pond myself to visit them all in the not so distant future. Another example of my year abroad allowing me to not only meet, but also keep friends from all over the world. As for now, I am looking forward to getting back into a routine in Leicester and to get settled back in properly for my final year (after a great summer)!